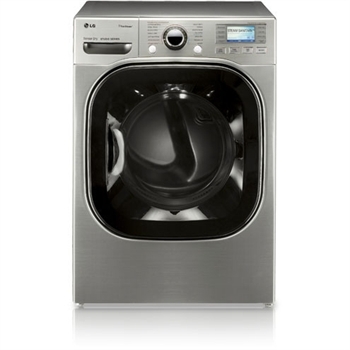 LG LSDG389VS Studio Series, Steam Dryer 7.4 Cu. Ft. Effectively combining excellent capacity and steam technology that results in more efficient drying, this LSDG389VS Steam Dryer from LG is a good investment for your home. Its impressive capacity at 7.4 cu. ft. makes this dryer ideal for huge loads, and its effective use of steam technology makes this gas dryer a cut above the rest. Whether you're drying regular clothing items or cleaning non-washable items such as pillows, this dryer will help you accomplish the job in almost no time. This dryer is best known for its impressive Steam Technology. The SteamFresh Cycle allows you to dry and minimize wrinkles on up to 5 garments in as little as 20 minutes. The SteamSanitary Cycle allows you to sanitize pillows, stuffed toys, and other items which are generally known to be non-washable. The TrueSteam Technology produces real steam so that odors are eliminated and wrinkles are reduced. This helps you to do away with ironing after drying. If you prefer ironing your clothes after drying, the EasyIron feature adds moisture to clothes right before the end of the dryer cycle, so that ironing them is a breeze. Choose from an extensive range of drying programs, whether it's in setting the right temperature level, drying level, dry times, and drying options. Drying program options include SteamFresh, Heavy Duty, and Manual Dry, among others. Drying options include Damp Dry, Rack Dry, and EasyIron to name a few. 4 Adjustable Legs help this dryer to achieve and maintain stability at all times, even when being used for large drying loads. This dryer is available three different styling options, from Graphite Steel to White to Wild Cherry Red. The over all design of this steam dryer is modern and stylish, especially with its transparent glass door and chrome door rim with silver edge. Skip ironing altogether or lessen your ironing time with the impressive Steam Technology of this dryer, as it effectively takes care of wrinkles and eliminates odors. Accomplish better drying results in lesser time as this huge capacity dryer allows you to accomodate bigger loads than most traditional dryers. Choose from different programs for your drying needs such as SteamFresh, Sports Wear, and Small Load and different options such as Custom Program, Wrinkle Care, and Drum Light. Easily monitor the time remaining during each cycle through the Remaining Time Display and Status Indicator. Experience a quiet drying operation through the LoDecibel Quiet Operation. Most gas powered dryers have higher price tags so acquiring these types of dryers is generally more expensive. Since ventilation is highly important in the installation of a gas dryer, professional installation is a must when putting up a gas dryer in your home. Gas dryers need to be maintained regularly and repaired immediately whenever needed. Timed Dry 60 min., 50 min., 40 min., 30 min., 20 min.